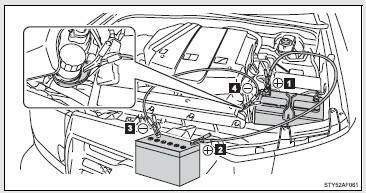 The following procedures may be used to start the engine if the vehicle’s battery is discharged. If you have a set of jumper (or booster) cables and a second vehicle with a 12-volt battery, you can jump start your Toyota following the steps below. Connect the jumper cable to ground on your vehicle as shown in the illustration. Start the engine of the second vehicle. Increase the engine speed slightly and maintain at that level for approximately 5 minutes to recharge the battery of your vehicle. Maintain the engine speed of the second vehicle and start the vehicle’s engine. 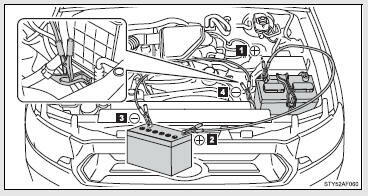 Once the vehicle’s engine has started, remove the jumper cables in the exact reverse order in which they were connected. ●Turn off the headlights and the audio system while the engine is turned off. ●Turn off any unnecessary electrical components when the vehicle is running at a low speed for an extended period, such as in heavy traffic, etc. ●Make sure the jumper cable is connected to the correct terminal and that it is not unintentionally in contact with any part other than the intended terminal. ●Do not allow the jumper cables to come into contact with the “+” and “-” terminals. ●Do not smoke, use matches, cigarette lighters or allow open flame near the battery. The battery contains poisonous and corrosive acidic electrolyte, while related parts contain lead and lead compounds. Observe the following precautions when handling the battery. ●When working with the battery, always wear safety glasses and take care not to allow any battery fluids (acid) to come into contact with skin, clothing or the vehicle body. ●Do not lean over the battery. ●In the event that battery fluid comes into contact with the skin or eyes, immediately wash the affected area with water and seek medical attention. ●Always wash your hands after handling the battery support, terminals, and other battery-related parts. ●Do not allow children near the battery. Do not pull- or push-start the vehicle, because the three-way catalytic converter may overheat and become a fire hazard.